This zoom control system features a fast response, low-noise and high-torque motor that can be attached to 19mm or 15mm rods with the included rod adapter bushing. 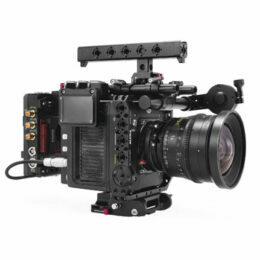 It’s perfect for operators in need of easy remote control of slow or fast zoom shots. The system is also compatible with Heden and Preston motors if you prefer. The hand unit’s menu allows for control of calibration, speed, and motor torque. It also includes a record start/stop button to allow you to control the camera’s recording in the palm of your hand. The hand unit includes an Arri Standard Rosette connection on the side which can attach to the included rosette pan handle adapter to allow you to mount the hand unit to fluid-head operating handles.